Our forklift training in Manchester is delivered on-site and at a time that is convenient for your business. As we want to fit in with the requirements of our customers, our team are available all day, every day. That means if you can only make time at a weekend, or during a bank holiday, we’ll be there. Our Novice Training is for individuals who have no previous truck experience. When they receive their certificate, they’ll have become competent operators, with the skills and confidence to succeed. Our qualified instructors also deliver Refresher Training aimed at current drivers, these focus on the individual maintaining a good standard of driving and learning new skills if necessary. If you have recently acquired new equipment, your staff can undertake Familiarisation Training in order to use it correctly and within the safety guidelines. 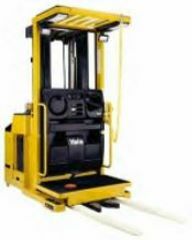 Our forklift training in Manchester also covers Attachment Training, for vehicles that are fitted with modified parts and Conversion Training for staff that will be using new equipment. At the end of every course the successful candidates will be provided with a certificate detailing the training they have undertaken and confirming a successful pass if appropriate. Your company will have fulfilled its obligations with regard to HSE regulations and your workplace will be a safer environment. Our skilled team can also offer more specialised assistance with other areas of your business. If there has been an accident and you feel unable to get to the bottom of it, our inspectors can carry out a Root Cause Investigation. They will write up their findings clearly and give practical advice on reducing the risk of a similar incident in future. To discuss this or any other aspect of our service, please don’t hesitate to give us a call.